For your next project on GitHub, take advantage of the service...s powerful API to meet your unique development requirements. 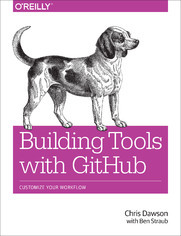 This practical guide shows you how to build your own software tools for customizing the GitHub workflow. Each hands-on chapter is a compelling story that walks you through the tradeoffs and considerations for building applications on top of various GitHub technologies. If you...re an experienced programmer familiar with GitHub, you...ll learn how to build tools with the GitHub API and related open source technologies such as Jekyll (site builder), Hubot (NodeJS chat robot), and Gollum (wiki).